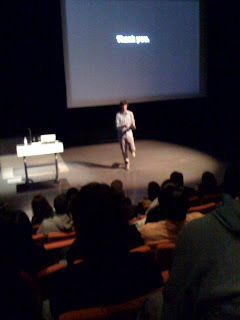 Here is Stefan last week (excuse the crappy cell phone photo and he lifts his leg a lot like that) at the Institute of Contemporary Art (ICA). He spoke about his latest project, 'Things I've learned in my life so far'. Unfortunately I had watched a TED talk of him just a week before which was almost identical to his speech. Personally I was amazed at the fact that these magazines and companies actually paid him to do the work for 'Things I've learned in my life so far' which basically consists of him creating a word using found objects, photographing it, and putting in a full spread or something like that. I thought it was great as an exercise in typographic art inserted into a sea of corporate ads and smiling faces. Although the viewer may not understand the message or the point initially, it forces them to question what it is and why it's there, ultimately raising their awareness of art around them in everyday life. I was also particularly interested in Sagmeister's identity system for the Casa de Musica in Portugal. It represents the shape of the building's architecture designed by Rem Koolhaas by using the external planes as graphic elements. By itself, it's not that impressive of a logo, but it's the application that's intelligent. The logo is able to rotate, flip, turn, be on it's side, upside down, whatever. It can exist in outline form, with opaque sides, it can be made of glass. And the color of the sides can be customized based off a photo or painting of the musician playing that week.